Cloud computing and consolidation forces hardware companies such as HP to seek higher margins. Most hardware vendors face single digit margins in their core business. To bolster margins, many vendors acquired system integration and BPO firms. For example, HP purchased EDS and Dell acquired Perot Systems. The next logical step requires the hardware vendors to get into software (see Figure 1). Software margins hover from 10% to 50% depending on the market. Expect a hardware vendor such as Cisco, Dell, or HP to acquire a cloud based company such as Salesforce.com or Rackspace to move into the software business. HP should go on the SaaS/Cloud offensive if they want to deliver rapid innovation to customers and break the cycle of dependence on packaged apps vendors such as Oracle and SAP. HP can challenge Oracle through a complete cloud stack of SaaS, Paas, DaaS, and IaaS by investing in white spaces in the solution road map with verticals and other pivot points that have not been well served. In addition, expect forms of SaaS BPO to emerge as clients seek best of breed SaaS and hybrid deployments. Oracle’s acquisition of Sun follows the 1970’s IBM playbook and HP will compete with Oracle in the long run. Oracle’s going after the “golden age of computing”. The impact — the tech industry reverts back to the beginning of a 40 year innovation cycle. For example, mainframe time sharing manifests as SaaS/Cloud. AS/400 and integrated computing evolves into appliances or cloud in a box. 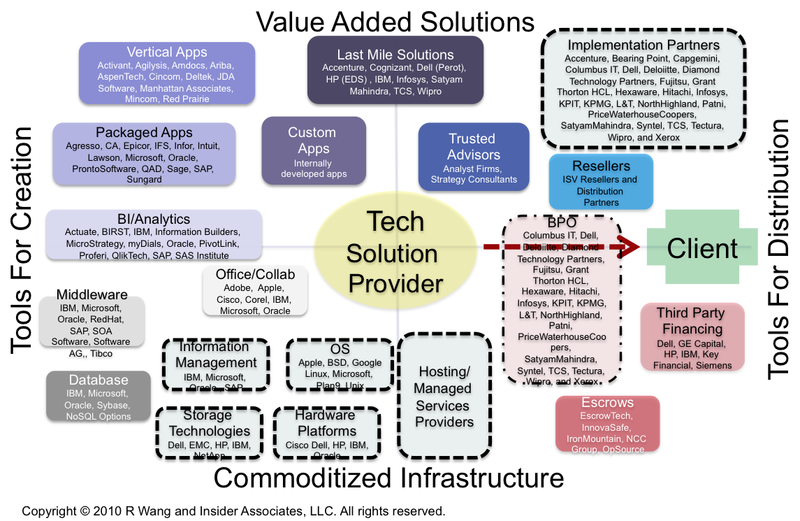 Oracle’s strategy takes silicon to software and signals a need to deliver turnkey verticalized, integrated offerings. Should HP continue to just serve in the commoditized infrastructure market, Oracle will beat HP in joint accounts for thought leadership and mind share. Oracle’s going after the high end server market and the verticalized appliances market. HP must have something to offer business leaders other than faster, better, cheaper boxes. Software solutions are admission to the party. HP could and should partner more closely with SAP in the short term to double up and battle Oracle. Apotheker and Lane bring software vision and leadership. Léo bring global software experience, effective salesmanship, and a highly strategic point of view. Ray Lane brings Silicon Valley credibility, long term vision, and wisdom sorely needed to the board. HP needs to make acquisitions in software to take this to the next level. Time is not on HP’s side. The core printer and ink business can be vulnerable and must be defended while making the play for enterprise software.